Major-General J.G.R. 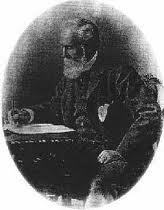 (James George Roche) Forlong was a Scottish military engineer in the Anglo-Indian Army, who received acclaim from the governments of England and India for his brilliant feats of road-building in the jungles of the Indian subcontinent during the Mahratta and Burmese wars. Forlong’s lifelong hobby was the comparative study of the religions of Man, a study which was facilitated by his knowledge of seven languages. He avidly pursued this avocation during his 33 extensive travels in India, as well as after retiring from the military in 1876. He is the author of two monumental works on the subject: Faiths of Man, a Cyclopaedia of Religions (1906) and Rivers of Life (1883). The latter is included in Section 1 of the A:. A:. reading list. Faiths of Man compares the various religions of mankind, demonstrating that many elements of the Christian mythos were borrowed from older religions. Rivers of Life traces the development of the great world religions back to their primitive origins in the worship of the sun and/or the phallus. Dux (rhymes with “hooks”) is Latin for “leader.” In the late Roman Empire, a dux was a military chief commanding the troops in a frontier province, and is the origin of the title “Duke.” The term “dux” is used in Scotland to denote a student who is academically first in his or her class.